Proper documentation and having a solid API explorer (Playground) is a crucial thing for your API success and likability by developers. There is a very informative slides by John Musser which highlights the top 10 reasons which makes developers hate your API, and unsurprisingly the top one is the lack of documentation and the absence of interactive documentation; so to avoid this pitfall I decided to document my Web API using Swagger. Swagger basically is a framework for describing, consuming, and visualizing RESTful APIs. The nice thing about Swagger that it is really keeps the documentation system, the client, and the server code in sync always, in other words the documentation of methods, parameters, and models are tightly integrated into the server code. Swagger is language-agnostic so there are different implementations for different platforms. For the ASP.NET Web API world there is a solid open source implementation named “Swashbuckle” this implementation simplifies adding Swagger to any Web API project by following simple steps which I’ll highlight in this post. The nice thing about Swashbuckle that it has no dependency on ASP.NET MVC, so there is no need to include any MVC Nuget packages in order to enable API documentation, as well Swashbuckle contains an embedded version of swagger-ui which will automatically serve up once Swashbuckle is installed. The sample ASP.NET Web API project I want to document is built using Owin middleware and hosted on IIS, I’ll not go into details on how I built the Web API, but I’ll focus on how I added Swashbuckle to the API. 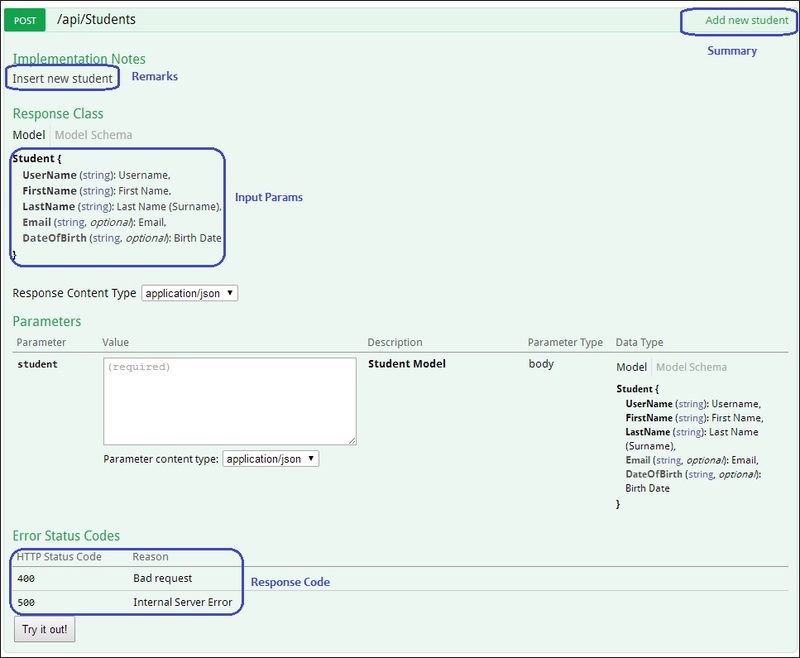 For brevity the API contains single controller named “StudentsController”, the source code for the controller can be viewed here, as well it contains a simple “Student” Model class which can be viewed here. Once this package is installed it will install a bootstrapper (App_Start/SwaggerConfig.cs) file which initiates Swashbuckle on application start-up using WebActivatorEx. This is not required step to use “Swashbuckle” but I believe it is very useful for API consumers especially if you have complex data models, so to enable XML documentation, right click on your Web API project — >”Properties” then choose “Build” tab, after you choose it scroll down to the “Output” section and check “XML documentation file” check box and set the file path to: “bin\[YourProjectName].XML” as the image below. This will add an XML file to the bin folder which contains all the XML comments you added as annotation to the controllers or data models. You can add Swashbuckle seamlessly to any Web API project, and then you can easily customize the generated specification along with the UI (swagger-ui). You can check the documentation and troubleshooting section here. That’s it for now, hopefully this post will be useful for anyone looking to document their ASP.NET Web API, if you have any question or you have used another tool for documentation please drop me a comment. The live demo API explorer can be accessed here, and the source code can be found on GitHub. i am using swash buckle 5.6.0 version and its converting my request dataModel Example into camel casing even my model in pascal casing in c#. any help ..how can i convert my model into pascal case in swash buckle. and its working fine for response model and converting into pascal case.but not working for my SwaggerRequestExample. I have looked all over but I did not see a post on how to modify Swagger Example Value. Please show how to modify Example Value to display polymorphic objects (parent and child objects).